Sieve besan and take it into a bowl. Add water and make a smooth batter. The batter should not be thick. (It should be like dosa batter consistency.) you can see in the pic. Heat Oil for deep fry in a pan. (The oil should be very hot) Take a skimmer or a skimming ladle, Place it above the pan. Pour the batter in the skimmer. Slowly drop the boondis into the oil. Fry boondi for few sec. 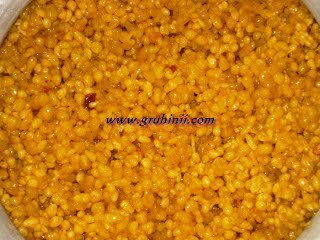 Remember that the boondi should not become crispy. It should be cooked but soft. 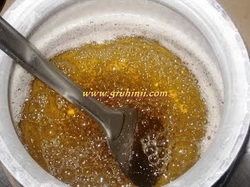 Remove the boondi from the oil, drain and drop the boondi in the sugar syrup. Mix well. Repeat the procedure until the batter is over. Heat 2 table spoons of ghee in a pan. 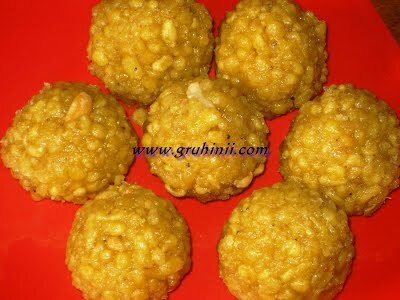 Fry the dry fruits until golden color and add them to the laddu mixture. Allow the mixture cool for some time and big lemon size laddus.